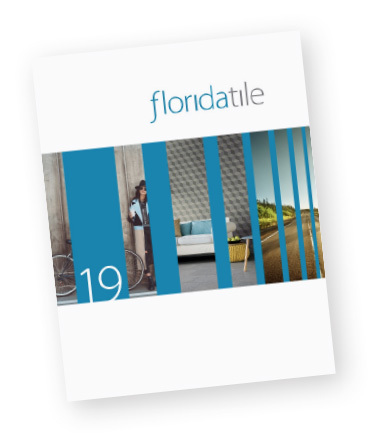 The Glamour collection from Florida Tile creates an allure and sophistication of timeless Hollywood and is the perfect answer for those seeking to add an element of drama to their environment. Porcelain floor and ceramic wall tiles are uniquely structured with visual texture for spaces in which the architectural component is vital. Designed with luxury hospitality in mind, these exquisite tiles will elevate any space to the next level of elegance and affluence. In the spotlight is a 12x24 rectified semi-gloss, glazed white porcelain tile with a geometric microstructure that adds a subtle design accent, without sacrificing an easy-to-clean surface. Awaiting its close-up is a 12x12 sized 1x4 straight-stacked mesh mounted porcelain mosaic, an uncomplicated contemporary piece fitting perfectly within the look of the line. The stars of this glamourous show are 10 beautiful decos in 9x18 (pressed), 12x24 and on-trend, 14x39 large format rectified ceramic wall tiles in a chic color palette of pristine glossy white, mirror, and gold. Bold architectural patterns in waves, geometric shapes, and straight-lines add movement and dimension to any room. Completing this collection is a full package of trims including bullnoses coordinating with the glossy ceramic wall and porcelain floor tiles, as well as, a glossy ceramic chair rail and stop. Glamour porcelain floor tile is appropriate for all residential and commercial, wall, countertop and backsplash applications and all residential floor applications. Ceramic wall tile is appropriate for all interior wall, countertop and backsplash applications and is GREENGUARD® certified. Due to the acute texture of this surface, current testing devices provide inconsistent DCOF results. The deco tiles have a low and high thickness due to their dimension.